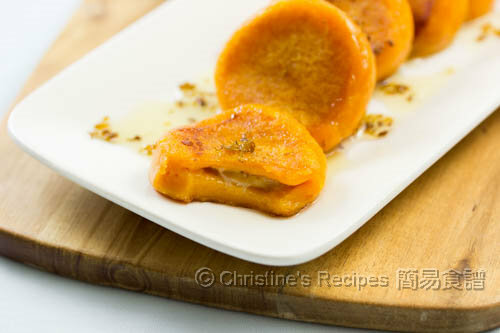 The method of making these sweet potato cakes is quite similar to those traditional Chinese dumplings. Yet, they are really unique in taste and combinations of ingredients used. By a close look at the recipe, you’ll notice it requires pan frying that helps caramelize the tender sweet potato wrappings and intensify the flavour. Upon biting, the fragrance and natural sweetness of banana inside will burst in your mouth and make every taste bud of yours dance. Mind you, the banana filling is quite hot when the cake is just off the pan. Don’t miss the Osmanthus syrup. It takes the whole dessert dish up to a notch and makes you feel enjoying at a high-end restaurant. Well, if you want something new for celebrating the coming New Year, why not give this dish a go and give your family a surprise? Peel and slice the sweet potato. Steam over medium-high heat for about 30 minutes, or until softened, tested with a chopstick that can easily poke into them. Discard excess water if any. Use a large spoon to press the sweet potato through a fine sieve. Mix in the sugar and salt. Gradually add the glutinous rice flour and knead into a dough. If the dough is dry, just add a bit of water. Or add some glutinous rice flour if you find it’s too wet. The dough surface should be not sticky to your hand. Peel the banana and cut into 12 thick slices. Set aside. On a clean floured surface, roll out the dough and cut into 12 equal portions. Flatten each portion and wrap a piece of banana. Seal tightly and knead into a ½-inch thick cake. Repeat this step to finish wrapping the remaining ingredients. Heat oil in a non-stick pan over medium-high heat. Place the cakes in one layer without touching each other. Cook both sides until lightly golden, cooked through, about 10 to 12 minutes. At the meantime, use a small sauce pan to cook water, dried Osmanthus and sugar until sugar’s dissolved. Stir in the honey. Remove from heat. 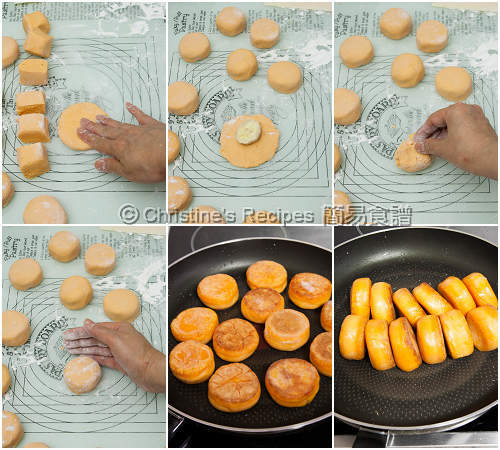 Pour the syrup over the cooked sweet potato cakes. Serve hot. I used Australian red sweet potato that has more water content. 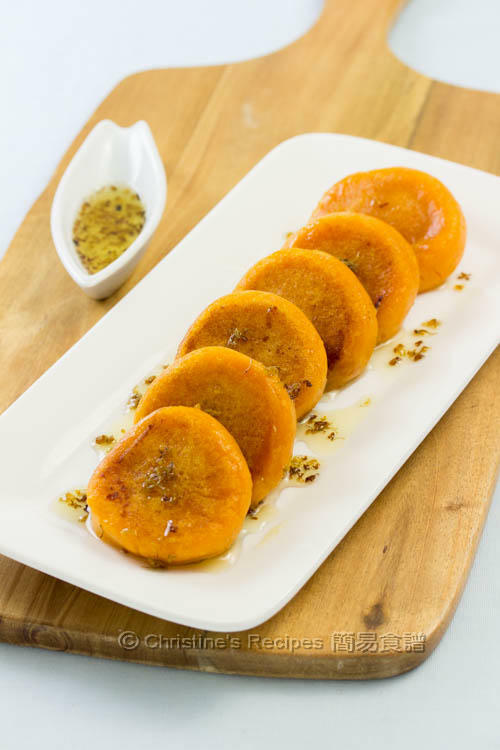 You might like to use other types of sweet potato, like yellow or purple ones. They are drier as far as I'm concerned. 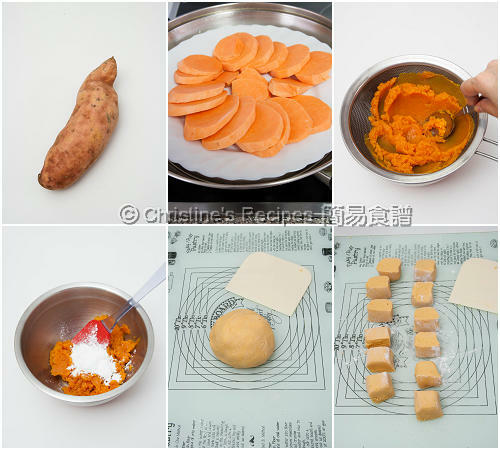 The water content contained in different type of sweet potato is various. You might need to add glutinous rice flour gradually, or in three or flour batches, not in one go, in order to form a dough, not sticky to your hand. 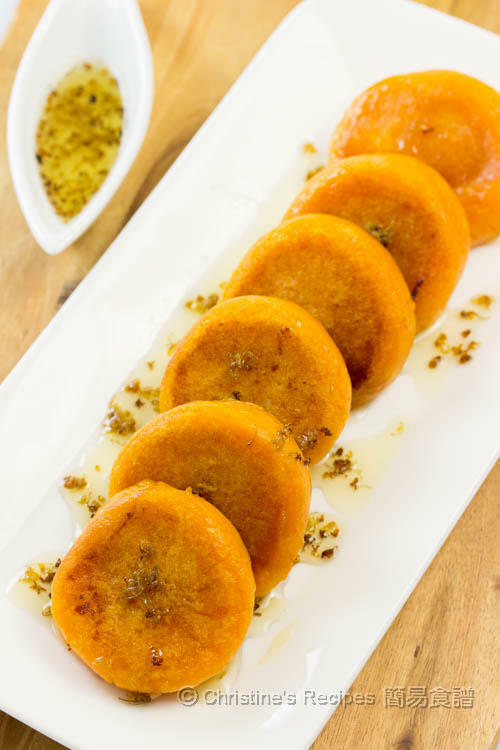 If you find your sweet potato is quite dry, you don’t need to add all the flour yielded by the recipe. You can adjust the consistency and texture of the dough by adding more flour or water whenever needed. Adjust the amount of sugar accordingly. While pan-frying the cakes, don’t use too high stove temperature because you don’t want to burn all the cakes before they are cooked through. Dried osmanthus is available at Asian grocers. Asian supermarkets should have stock as it's a common ingredient in Chinese desserts. A very healthy and delicious treat, Christine. I really love the idea of using banana as the filling. Is osmanthus a form of spice/herb or tea? And where can you find it in the Asian market? I got it from a nearby Asian grocer. It's a common ingredient that used to make Chinese desserts. It's normally placed next to herbs or tea leaves. You might ask for the staff to help you to locate it. Hi, can i boil the sweet potatoe instead of steaming it? Steaming can keep more flavours. But you can boil it instead. Hi Christine, can I use alternative flour (water chestnut flour, arrow root flour,) instead? You might experiment with other kind of flours. But the texture will be totally different from mine. I live in the Med. We dont have any Asian stores. Can I substitute anything for the Osmanthus? Osmanthus is quite unique in smell. It's hard to find something to replace it. You might skip it if you can't find any. Can I bake this instead of frying? Not recommend to bake. The sweet potato cakes will be very dry.